I love making creative snacks for my family. The look on their faces when I whip up some of our recipes like the loaded zucchini skins or our popcorn chicken nuggets is priceless! 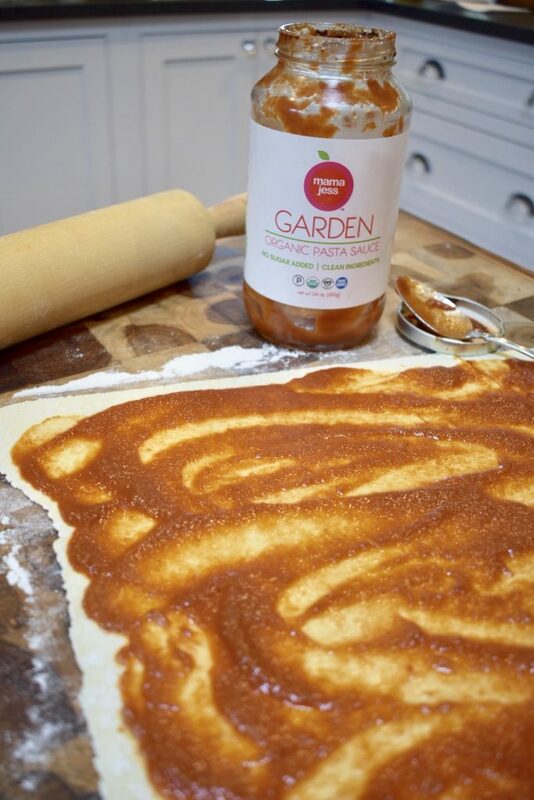 Today I incorporated our sauce into pizza pinwheels…and this recipe quickly turned into one of the most delicious ways to make pizza that I have ever had! I love how quick these are to make, so you can have them hot when the kids get off the bus. The first thing you want to do is roll out the thawed puff pastry sheet so there are no creases. From there, spoon Mama Jess Organic Garden Pasta Sauce on the pastry, creating an even layer. Then…sprinkle your toppings! I am a big pepperoni fan, but you could also brown some ground Italian sausage if you are a sausage pizza fan. Or go vegetarian with spinach and peppers! On top of that, sprinkle a layer of mozzarella followed by a layer of basil and a sprinkling of salt. Now it’s time to roll! Similar to how you would make homemade cinnamon rolls, start at one end and roll towards the other, so you have one long pizza tube. Next, grab the sharpest knife you have. You will want to cut each pinwheel about 1/2 inch thick, and it’s easier to saw through this rather than cut down because you want to keep the pinwheels as round as possible. 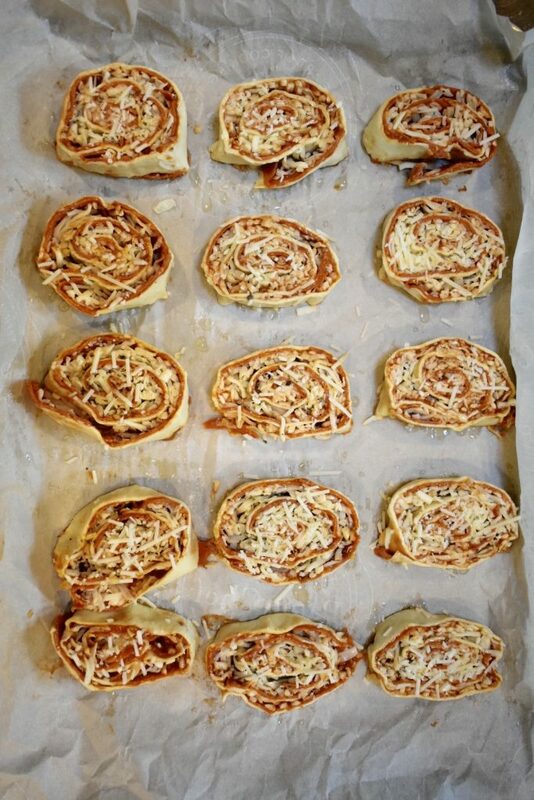 Lay pinwheels flat on a parchment lined baking sheet. Lightly coat with an egg wash, and if you’re feeling crazy, sprinkle some Parmesan cheese on top. Bake at 400 degrees for 23-25 minutes, or until the cheese has melted and the puff pastry is golden and flaky. 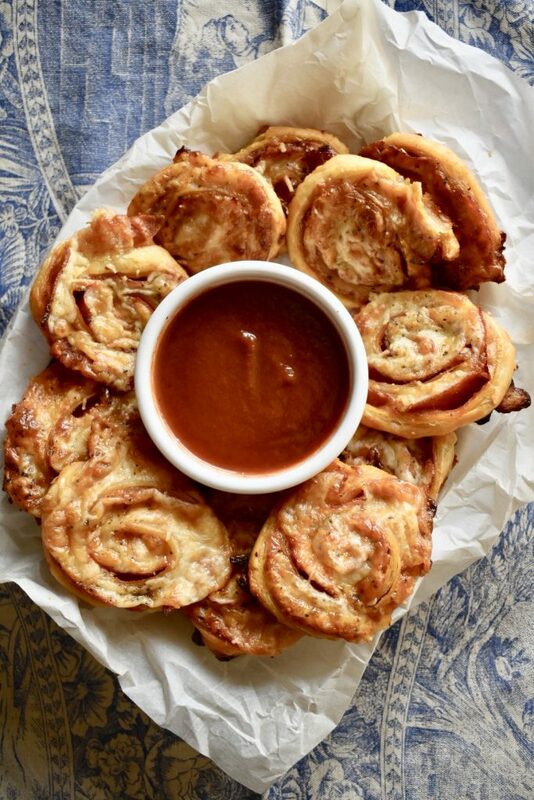 Serve warm with a small bowl of warmed up Mama Jess sauce to dip the pinwheels into! Enjoy!